Pictured here is a product we are now stocking, that enables a patio sliding door lock to be replaced with a key entry model. It is designed to be a flush mount, meaning that the handles are fitted into the body of the door frame, which also makes them very suitable for pocket doors. This beautiful and simple design is fundamentally different to many other similar type products because the actual latch only requires a small hole in the door edge for installation. There are very few key lockable patio/pocket door locks available at such a competitive list price. Installation of these locks often requires some patch work necessary to fill the holes in the PVC door frame. We use a very special product especially designed to repair virtually any PVC frame or pipe. It is designed to fill the existing hole/s simply and matchable to virtually any color. The list price on this lock is $29.99 but it can be found even cheaper if you search in depth online. Pocket Door Lock/Patio Door Lock with key, now available here today. This product is designed for maximum 1-1/4" thick doors. I know this from first hand experience and not reading the instructions properly. This example is from over 1 year ago online by a professional locksmith in the United Kingdom. Chubb have an overseas license to the Medeco M3 lock system and market it complete with the Chubb name embossed on the product. Medeco technology is requested by many US companies attempting to maintain some uniformity across their properties, however as this video plainly shows, the Medeco product is NOT BUMP PROOF. I must repeat that the original and first bump proof pin tumbler lock cylinder product on the market is the Bilock Extreme Security mechanism. With Bilock, you can guarantee that duplicate keys cannot be produced and that bump keys WILL NOT WORK. 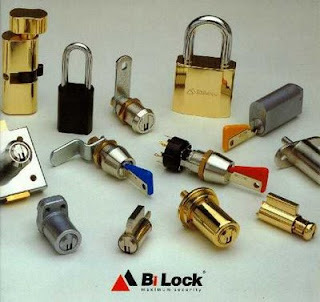 Bilock locks were first manufactured in Australia in the early 1970's. The product is found in 132 countries around the world and is favored by casinos, banks and government institutions to protect property. How often have you travelled to a different town or country, parked your rental car in a multi-level carpark, returned but have forgotten where you parked the car? How often have you been to an unfamiliar place only to have your bearings all turned around? Maybe you travel overseas, stay in hotels but forget which corner your hotel is on. Here is a novel product that can assist you with not having to remember all the gory details. Simply activate the GPS, lock in your current position, go on your way and use it's locator function to return you to home. My primary concern with an item of this kind is that potentially you give a potential thief, your exact location of your property. They will have your key and your property location. Is that smart? The above video is one of the most recent items of evidence that clearly show Schlage Primus locks are NOT BUMP PROOF. There are multiple advertizers online that falsely advertize Primus as a bump proof product. It never has been or is capable of being bump proof. While it is true, that Primus is a very good quality product, this video evidence proves beyond any doubt that the product is not bump proof as advertized by so many online marketers. So who do you believe today? If some locksmiths are proven wrong, who do you trust? Put your trust in Bilock Extreme Security products. The original 100% fully guaranteed bump proof pin tumbler product on the market. I am not so sure if readers fully appreciate the temerity of the situation with bump keys. Bump keys can be created by anyone who has access to the pin tumbler key belonging to a lock or group of locks. You see, if someone has a key in their hand, that slides into the desired keyhole (it doent have to turn - just slide in), they can create a bump key for that very lock or group of locks. Where it gets scarier, is considering that large institutions, universities, churches, hospitals, public amenities, government capitol buildings, defense department facilities, naval boats, office complexes etc, that operate using a master key system or multiple systems are even more prone to this simple form of attack. Master key systems that employ the modern pin tumbler principle ( as originally patented by Linus Yale in 1864), which include almost all the most recognizeable brands today, Schlage, Kwikset, Tylo, Yale, Corbin, Assa, Medeco, Primus, Scorpion, Lockwood, Russwin, Baldwin, Cambridge, Plymouth, Mul-t-lock, Best, Falcon, Master, ILCO, American Lock just to name a few are built using multiple pins (also called wafers) in each tumbler position. This fundamentally exposes each lock cylinder to substantially less security. These keyholes are even easier to circumvent using the bump key techniques. I took a call from Mike the other day who reported a problem with securing his front and back doors. It seems his neighbors in the other three condominiums had all been broken into by having their doors kicked open. My first and automatic response to this kind of question is to recommend the Strikemaster II product be installed to front and back door jambs. I explained that the cardinal reason, many doors get kicked open is because they are the easiest way to get in. You see, most locks today are installed on steel case doors. The inside and outside skin of modern external doors is encased in light steel. When installing any lock to the door the lock rarely gives way in attempted break ins. It is more often the door jamb. That area where the door closes into. The strike plate that most existing knobs and deadbolts lock into are most often held on to the door jamb by short 1" long wood screws. Why? Because most door jambs are constructed of 1" wide pine. The secret to making sure your doors are secure, do go two fold. First you need to make sure the door locks are unable to be picked or bumped or bypassed. I recommend Bilock Extreme Security products for total lock protection. Second you need to ensure that the door jamb is secured to the stud behind it. Using the Strikemaster II, provides 5' long laminated steel brace secured by 10 x 3" screws, designed to attach to the stud behind the door jamb. Combining these two methods will deter virtually any reasonably determined intruder. We are booked next Thursday, thanks Mike. I'm trialling a new idea to use to advertise for business and wouldnt mind peoples opinions and subjects of interest related to security. Bilock is without doubt the world's leading modern key system. Sure, it is a system originally developed in Australia in the 1970's, but it has proven since then that it will fit in the widest range of other manufacturers product lines. From Schlage to Baldwin, Arrow to Corbin, Carbine to Cal-Royal, Marks to Russwin, USLock to LSDA to GMS, Bilock cylinders will retrofit in almost all quality hardware from many of the leading manufacturers. To top that off, Bilock's engineers will custom manufacture any requested application. So, if you want to have your obsure lock or handle operate using the remarkably secure and fully protected and patented Bilock Extreme Security locking system, simply contact us today for an estimate. As you can see in the above picture, Bilock also manufactures many OEM products too. The picture also shows many cylinders designed to retro-fit into your existing hardware. This means that you can reduce the cost of securing your properties by replacing just the cylinders instead of the complete hardware (handles or locks). Why not maintain your existing functions while having the leading key control system with the most competitively priced, aesthetically pleasing color coded keys and locks of their kind available today? Bilock products are found in almost every country in the world. Most casinos rely on Bilock products to maintain the security of poker machines, cash dispensers even hotel room doors. The versatility of master key systems using Bilocks multi-million key changes, the ability to identify easily which key works which lock by the color coded heads, combined with the virtually impossible to pick or bump mechanism makes Bilock your best choice for securing your family and your posessions. How many different brands of locks do you have at home or the office? Do you need so many different keys to maintain all those locks? Speaking to our trained Bilock technicians could potentially reduce your key needs to just one key, without necessarily replacing all your hardware. It makes perfect sense in todays economy to give yourself peace of mind with the best security products performing the best and most reliable functionality while maintaining the original look and feel of your existing hardwares, using easily identifiable keys that are color coded and impossible to duplicate. Why are the keys so hard to duplicate? Because they are all created as originals. Each key is carefully produced and folded into shape making each key unique (even if they are copies of each other). As the leading Bilock dealer in the mid-west, we use sophisticated software to build all our systems. All keys are recorded and individually marked with a unique number. 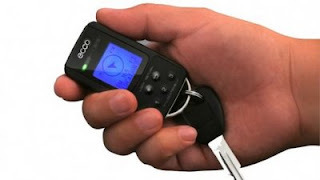 Tracking your keys will never be so easy. Pictured here is the Sargent & Greenleaf 8415 Extension 50 Deadlatch. This superb product comes from the world leader in safe lock design and manufacture. 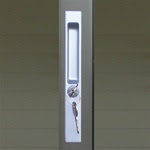 It is designed for use on either inswing or outswing doors that require a much higher degree of security. This lock operates using a mechanical dial pad with a resettable combination and a turnbutton on the inside for emergency egress. The unique design of the strike (keeper) makes this lock one of the strongest locks of it's type available today preventing doors and jambs from being spread open. Perfect for use on ATM's, Computer Rooms, High Security Storage areas, Research Laboratories etc. All units include a purposely manufactured hardened steel plate to resist drilling, that fits between the lock body and the application or door. This is a surface mounted lock so designed to suit a wide range of applications. This is an American manufactured solution that offers the best security available today. A new twist to the issue plaguing American cities and the once reputeable locksmith industry. It has become apparent that the sham companies and masqueraders are becoming much more bold in their endeavours to destroy the locksmith industry from outside, using techniques that border on the rediculous. A story appeared last week on CBS2 Chicago about well known and long established locksmith Gale Johnson. Gale is an industry stalwart and editor of the world reknowned Locksmith Ledger Magazine. This particular story, highlighted a new twist to the ongoing saga of the locksmith scammer issues. 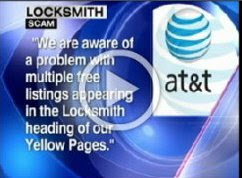 It seems apparent that established locksmith companies are now coming under attack through AT&T directly. Not by AT&T but by people apparently calling AT&T to cancel advertizing related to particular established telephone numbers. Johnsons Locksmiths in Evanston Illinois, has been established in excess of 65 years in the Chicago area. They are a repeated victim of the scammers attempts to steal their trading name and telephone number. And to top all this off, AT&T admit to a problem with multiple free listings in the locksmith sections of their telephone books, across the country. In my town, there are fake listings not just in Yellow Pages but also across multiple mediums including but not limited to Google, Yahoo, Bing, Yellow Pages etc, for locksmiths that advertise addresses and telephone numbers similar to my personal address and my business telephone number, in the hope that potential customers will be misled to call them instead of whom they were intending (me). I took a call last week from a customer who told me that they had called one of the numbers asking for me by name and the operator transferred the call to someone posing as me. The customer knew something was not right due to the person they were speaking to, did not sound like me, nor did they recollect any of our past dealings. That these people will stoop to such depths to ruin a persons reputation and rip off unsuspecting customers is another example of the loopholes that are being discovered in search mediums. The current economic situation is bad enough to encourage these charlottans to perform this new breed of espionage on the unsuspecting general public and marketplace. Pictured here is the worlds #1 selling product for securing swimming pool gates and the like. The Vertical Pull Model (on right), also known as the Pet Latch, uses the same revolutionary technology as the Top Pull Model (on left) in a smaller, more compact body. 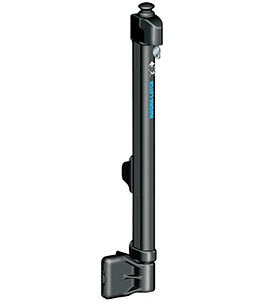 It is suitable for mounting on taller pool gates where it will still be out of reach of children, as well as on garden or household gates to provide a safety barrier for pets. Like the Top Pull Model, the Pet Latch offers easy adjustment, is key-lockable for added security and won't disengage from shaking or pulling. Always confirm local fence/barrier regulations before installation.